Each year since 2010, Syniverse has held an annual customer conference in India, and I’m pleased to share here a recap of this year’s event. 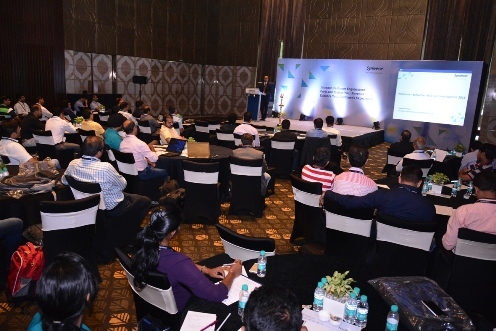 The workshop has grown in size each year in line with the rapid rise of mobile in India, and the event offers some useful insights on how the next chapter of mobile may unfold here. 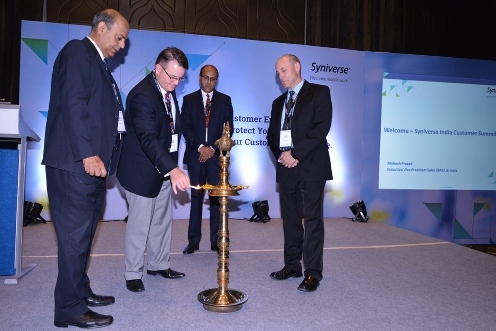 This year’s workshop took place in Gurgaon, on Oct. 7, and it brought together more than 110 of our Indian customers as well as over 15 Syniverse senior leaders, including Jeff White, Group Vice President, Global Sales; Mahesh Prasad, Executive Vice President, Sales, EMEA and India; John McRae, Group Vice President and General Manager, Revenue and Connectivity Management; and Kyle Dorcas, Vice President, Policy and Risk Management. (From left) Me, John McRae, Mahesh Prasad and Kyle Dorcas light a lantern for prosperity and good fortune at the start of the workshop. Improving ARPU (average revenue per user) – ARPUs have been in a steady decline because of increased competition. For this reason, it’s become crucial to turn to customer engagement strategies as ways to not only build stronger relationships with subscribers, but to open new revenue streams as well. Strengthening quality of service – Maintaining excellent quality of service helps prevent operators’ subscribers from moving to the competition. But in a time of intense competition and tighter budgets, providing this high level of service and customer engagement must be undertaken strategically. Managing increased infrastructure spending – The rollout of 4G networks is requiring operators to take on a number of new costs. It’s vital for them to have a plan that balances costs over time but still ensures that they stay engaged with customers and keep pace with their LTE service expectations. Our workshop in session, with Mahesh Prasad speaking. MVNOs – One area offering a consistently strong market opportunity in India is the MVNO model. MVNOs have the capability to gain more customers through different brands, increase market share in mature markets, expand reach to niche segments, and generate additional revenue from leasing out networks. Our MVNO session covered the basics of how to launch an MVNO as well as some of the most important issues and trends affecting the MVNO model now. LTE networks – LTE is rapidly becoming a standard for mobile service, and mobile users in India are increasingly expecting access to the broadband experience that LTE delivers. But LTE rollout presents numerous challenges to understand and prepare for. On the technology end, for example, operators have to install new equipment and adapt existing infrastructure. Likewise, on the business end, they have to determine new pricing structures and establish new partnerships for roaming and interconnecting. Our LTE session explored these opportunities and challenges, and it was based on our recent experience in helping operators in Brazil prepare to provide LTE service at the Olympics and on our VoLTE webinars we’ve hosted this year. Making a point during the workshop. The workshop was personally rewarding to me in several ways. Most of our customers from across India were able to travel to Gurgaon to be at the event, and some customers from Sri Lanka even made the long trip to be there. Having a chance to see them all at one time and witness this customer support always makes me feel extremely grateful. Even more gratifying is that some customers have told us they now consider this a must-attend event that gives them a valuable opportunity to find out about the latest things at Syniverse, gain insights on the biggest issues and trends in mobile, and meet with a number of their colleagues. 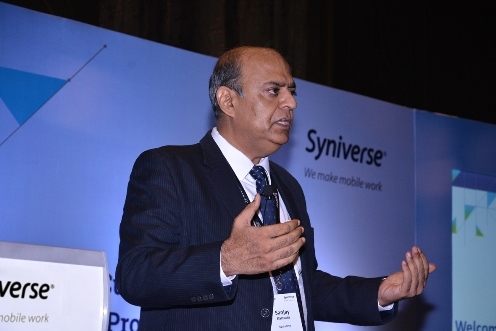 On a final note, since joining Syniverse in 2005 as its first employee in India, Syniverse has grown to over 750 employees in India as mobile use in India has soared over the past 10-plus years. As both a mobile professional and an Indian citizen, I look forward to seeing what directions the market moves in next. Our annual workshop offers an exciting opportunity to help prepare our customers for this next chapter of mobile. 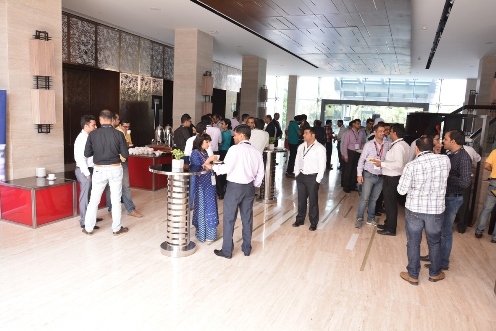 Attendees enjoy one of the many networking sessions and tea breaks we held throughout the day. Sanjay is a former Vice President and Managing Director of Sales in India for Syniverse. Thank you for your comment, Rajesh! We look forward to helping our customers continue to stay on top of the latest issues and trends in telecom in 2017.